The present invention relates to a method for producing flame-proofed porous polyurea-based materials, comprising the following steps: (a) reacting at least one polyfunctional isocyanate (a1) and at least one polyfunctional aromatic amine (a2) in an organic solvent, optionally in the presence of water as component (a3) and optionally in the presence of at least one catalyst (a5); and subsequently (b) removing the organic solvent so as to obtain the organic porous material, wherein step (a) is carried out in the presence of at least one organic flame-proofing agent as component (a4), which is soluble in the solvent. The invention relates to the porous materials which can thus be obtained and to the use of the porous materials for thermal insulation. wherein step (a) in the presence of at least one organic flame retardant is made as component (a4), which is soluble in the solvent. Furthermore, the present invention, the obtainable porous materials and the use of porous materials for thermal insulation is concerned. Porous materials such as polymer foams, with pores in the size range of a few micrometers or significantly lower, and a high porosity of at least 70% are particularly good thermal insulators due to theoretical considerations. Such porous materials having small average pore diameter may be present examples game as organic xerogels. In the literature, the term xerogel is not used uniform throughout. In general, a porous material is understood to be a xerogel, which has been prepared by a sol-gel method wherein the liquid phase is removed by drying below the critical temperature and below the critical pressure of the liquid phase ( "subcritical conditions") from the gel was. on the contrary, we speak generally of aerogels len if the removal of the liquid phase from the gel was carried out under supercritical conditions. In the sol-gel process, a sol is first prepared on the basis of a reactive organic gel precursor and the sol is then gelled by a crosslinking reaction to form a gel. In order to obtain a porous material such as a xerogel from the gel, the liquid must be removed. This step is hereinafter simply referred to as drying. WO-2008/138978 xerogels are containing from 30 to 90 wt .-% of at least one polyfunctional isocyanate and from 10 to 70 wt .-% polyfunctional at least one aromatic amine are known, the volume-weighted mean pore diameter is at most 5 micrometers. However, the known from the prior art show during drying, particularly in drying under subcritical conditions, shrinkage reduction in porosity and increase in density. Another problem with the methods known from the prior art formulations based on isocyanates and amines are inadequate for many applications, the flame retardant properties. It was therefore the object of avoiding the aforementioned disadvantages. In particular, a porous material should be made available which has the aforementioned disadvantages to a lesser extent. The porous materials should have a favorable thermal conductivity in vacuo. In addition, the porous materials also at pressures above the vacuum region, in particular in a pressure range from about 1 mbar to about 100 mbar should have a low thermal conductivity. This is desirable because in vacuum panels in the course of time, a pressure increase occurs. In addition, the porous materials should also have in a ventilated state, ie, at atmospheric pressure, favorable thermal conductivities. Further, the porous material should have a high porosity, a low density and a sufficiently high mechanical stability combined with favorable flame retardance simultaneously. It should be found a process which leads to porous organic materials with improved flame retardant properties. At the same time, the materials should have a favorable pore structure, so-called advantages are obtained above. Upon removal of the solvent from the resultant gel body occurring shrinkage should be minimized, particularly when the solu- will solvents removed under subcritical conditions. (B) removing the organic solvent to obtain the organic porous material, wherein step (a) is carried out in the presence of at least one organic flame retardant as the component (a4), which is soluble in the solvent. An organic flame retardant is an organic compound that is also a flame retardant. An organic compound is a compound comprising at least one carbon atom. A flame retardant is a compound or a mixture of several compounds which improves the flame retardant properties of the resulting porous materials. The flame retardant properties are characterized in the present invention by the BKZ test. Under BKZ test is to determine the fire index (flammability and smoke level) according to the "Guidelines for fire regulations: building materials and components", Part B: Test Regulations, 1988 edition Cantonal (with supplements 1990, 1994 and 1995) of the Association Feuerversicherun- conditions (sales promotion) Roger that. Preferably, a flame retardant is characterized in that it leads to a flammability of the resulting porous materials of 5 in BKZ test. Preferred embodiments are take the claims and the description corresponds to. Combinations of preferred embodiments are within the scope of this invention. Preferred embodiments of the components used are first explained. In the present process is reacted as component (a1) at least one mehrfunk- tional isocyanate. In the context of the inventive method, the amount of component (a1) used is preferably at least 20 wt .-%, in particular at least 30 wt .-%, particularly preferably at least 40 wt .-%, most preferably at least 55 wt .-%, in particular at least 68 wt .-%, each based on the total weight of components (a1) to (a4), which is 100 wt .-%. In the process of the invention, the amount of component (a1) used is also preferably not more than 99.8 wt .-%, in particular more than 99.3 wt .-%, particularly preferably not more than 97.5 wt .-%, each based on the total weight of components (a1) to (a4), which is 100 wt .-%. (MDI), 1, 5-naphthylene diisocyanate (NDI), 2,4- and / or 2,6-tolylene diisocyanate (TDI), 3,3'-Dimethyldiphenyldiisocyanat diisocyanate, 1, 2-diphenylethane diisocyanate and / or p-phenylene ( PPDI), tri-, tetra-, penta-, hexa-, hepta- and / or Octamethylendiisocy- Anat, 2-methyl pentamethylene-1, 5-diisocyanate, 2-ethylbutylene-1, 4-diisocyanate, penta- methylene-1, 5-diisocyanate, butylene-1, 4-diisocyanate, 1-isocyanato-3,3,5-trimethyl-5-iso-isocyanatomethyl-cyclohexane (isophorone diisocyanate, IPDI), 1, 4- and / or 1, 3- bis (iso- isocyanatomethyl) cyclohexane (HXDI), 1, 4-cyclohexane diisocyanate, 1-methyl-2,4- and / or -2,6-cyclohexane diisocyanate and 4,4'-, 2,4'- and / or 2 , 2'-dicyclohexylmethane. iii) mixtures of at least an aromatic isocyanate according to embodiment i) and at least one aromatic isocyanate according to embodiment ii). As a multifunctional isocyanate is particularly preferred oligomeric diphenylmethane diisocyanate. In oligomeric diphenylmethane diisocyanate (hereinafter referred to oligomeric MDI) is a mixture of several oligomeric condensation products and thus derivatives of diphenylmethane diisocyanate (M DI). The mehrfunkti- tional isocyanates may preferably be composed of mixtures of monomeric aromatic diisocyanates and oligomeric MDI. Oligomeric MDI contains one or more polynuclear condensation products of MDI with a functionality of more than 2, preferably 3 or 4 or 5. Oligomeric MDI is known and is often referred to as polyphenylpolymethylene or as polymeric MDI. Oligomeric MDI is usually composed of a mixture of MDI-based isocyanates with different functionalities. Typically, oligomeric MDI is used in a mixture with monomeric MDI. The (average) functionality of an isocyanate containing oligomeric MDI, in the range of about 2.2 to about 5 can vary, in particular from 2.4 to 3.5, especially from 2.5 to 3. Such a mixture of MDI based of polyfunctional isocyanates with different functionalities in particular, the crude MDI, which is formed usually catalyzed by hydrochloric acid, as intermediate in the production of crude MDI in the preparation of MDI. Multifunctional isocyanates or mixtures of a plurality of polyfunctional isocyanates based on MDI are known and are sold for example by BASF Polyurethanes GmbH under the name Lupranat®. 8.5 mmol / g. The skilled worker is aware that the content of isocyanate groups in mmol / g, and the so-called equivalent weight in g / equivalent are in a reciprocal relationship. The content of isocyanate groups in mmol / g is obtained from the content in wt .-% according to ASTM D-5155-96 A. In a preferred embodiment, the component (a1) consists of at least one polyfunctional isocyanate selected from diphenylmethane-4,4'-diisocyanate, diphenylmethane-2,4'-diisocyanate, diphenylmethane-2,2'-diisocyanate, and oligomeric diphenylmethane diisocyanate. In this preferred embodiment, the component (a1) particularly preferably comprises oligomeric diphenylmethane diisocyanate and has a functionality of at least 2.5. The viscosity of component (a1) used may vary within a wide range. Preferably, the component (a1) has a viscosity from 100 to 3000 mPa.s, more preferably 200-2500 mPa.s at. According to the invention, component (a2) at least one polyfunctional aromatic amine. Component (a2) may be partially generated in situ. In such an exemplary form, the reaction is performed under the presence of water (a3) ​​of step (a). Water reacts with the isocyanate groups to amino groups, releasing CO2. Thus, partially as an intermediate product to be produced (in situ) polyfunctional amines. They are converted to reaction with isocyanate groups in the further course to urea linkages. In this preferred embodiment, the reaction in the presence of water and a polyfunctional aromatic amine as component (a2) and optionally in the presence of a catalyst (a5) is carried out. In a further, likewise preferred embodiment, the reaction of component (a1) and a polyfunctional aromatic amine as component (a2) optionally in the presence of a catalyst (a5) is carried out. No water (a3) ​​is present. Multifunctional aromatic amines are known to those skilled in the. Among the polyfunctional amines are understood to be those which contain at least two isocyanate-reactive amino groups per molecule. Opposite th isocyanates are reactive primary and secondary amino groups, the reactivity of the primary amino groups is generally much higher than that of the secondary. The polyfunctional aromatic amines are preferably two polynuclear aromatic compounds having two primary amino groups (bifunctional aromatic amines), corresponding to three - or polynuclear aromatic compounds having more than two primary amino groups or mixtures of the aforementioned compounds. Preferred polyfunctional aromatic amines of component (a2), particular isomers and derivatives of diaminodiphenylmethane. wherein R 1 and R 2 may be the same or different and are independently selected from hydrogen and linear or branched alkyl groups having from 1 to 6 carbon atoms, and wherein all substituents Q 1 to Q 5 and Q 1 'to Q 5' are the same or different are selected and are independently selected from hydrogen, a primary amino group and a linear or branched alkyl group having from 1 to 12 carbon atoms, which alkyl group may bear further functional tional groups, with the proviso that the compound of general formula I at least two primary amino groups, wherein at least one of Q 1, Q 3 and Q 5 is a primary amino group and at least one of Q 1 ', Q 3', and Q 5 'is a primary amino group. In one embodiment, the alkyl groups within the substituents Q in the general formula I are selected from methyl, ethyl, n-propyl, iso-propyl, n-butyl, sec-butyl and tert-butyl. Such compounds are referred to below as the substituted aromatic amines (a2-s). However, it is also preferred if all the substituents Q are hydrogen, provided they are not as defined above amino groups (so-called non-substituted polyfunctional aromatic amines). R 1 and R 2 in the general formula I are preferably the same or different and are independently selected from hydrogen, a primary amino group and a linear or branched alkyl group having from 1 to 6 carbon atoms. Preferably R 1 and R 2 are selected from hydrogen and methyl. Particularly preferably R 1 = R 2 = H. applies Suitable polyfunctional aromatic amines (a2) are also particularly I- somere and derivatives of toluenediamine. In the context of component (a2), preferred isomers and derivatives of toluene are particularly toluene-2,4-diamine and / or toluene-2,6-diamine and Diethyltoluoldiamine, in particular 3,5-diethyltoluene-2,4-diamine and / or 3.5 diethyltoluene-2,6-diamine. Very particularly preferred component comprises (a2) at least one of polyfunctional les aromatic amine selected from 4,4'-diaminodiphenylmethane, 2,4'-diaminodiphenylmethane, 2,2'-diaminodiphenylmethane and oligomeric diaminodiphenylmethane. Oligomeric diaminodiphenylmethane contains one or more methylene-bridged polynuclear condensation products of aniline and formaldehyde. MDA oligomer contains at least one, but generally more oligomers of MDA having a functionality of more than 2, preferably 3 or 4 or 5. Oligomeric M DA is known or can be prepared by methods known per se. Typically, oligomeric MDA is used in the form of mixtures with monomeric MDA. The (average) functionality of a polyfunctional amine of the component (a2), WEL ches oligomeric MDA contains, in the range of about 2.3 to about 5 can vary, in particular from 2.3 to 3.5, in particular from 2.3 to 3. such a mixture of MDA-based polyfunctional amines with different functionalities is particularly the crude MDA, which is formed in particular in the condensation of aniline with formaldehyde, usually catalyzed by hydrochloric acid, as intermediate in the production of crude MDI. Particularly preferably, the at least one polyfunctional aromatic amine diaminodiphenylmethane or a derivative of diaminodiphenylmethane. More preferably, the at least one polyfunctional aromatic amine contains oligomeric diaminodiphenylmethane. It is particularly preferred if the component (a2) comprises oligomeric diaminodiphenylmethane as the compound (a2) and has an overall functionality of at least 2.1. In particular, the component (a2) comprises oligomeric diaminodiphenylmethane and has a functionality of at least 2.4 at. It is possible within the scope of the present invention to control the reactivity of the primary amino groups, by substituted polyfunctional aromatic amines are used as part of component (a2). The above and subsequently executed substituted polyfunctional aromatic amines, hereinafter referred to as (a2-s), can be used in mixture with the above-mentioned (non-substituted) diaminodiphenylmethanes (all Q in formula I is hydrogen, except where Nh) are or used exclusively. In this embodiment, Q 2, Q 4, Q 2 'and Q 4' is preferably selected within the scope of Formula I shown above, including the associated definitions so that the compound according to general formula I at least one linear or branched alkyl group which can carry further functional groups, having from 1 to 12 carbon atoms in α-position to at least one bonded to the aromatic nucleus primary amino group. Preferably, Q 2, Q 4, Q 2 'and Q 4' is selected in this embodiment so that the substituted aromatic amine (a2-s) comprises at least two primary amino groups, each having one or two linear or branched alkyl groups having from 1 to having 12 carbon atoms in α-position, which may bear further functional groups. Provided that one or more of Q 2, Q 4, Q 2 'and Q 4' is selected so that they chen linear or branched alkyl groups having from 1 to 12 carbon atoms correspond carrying further functional groups, then are amino groups and / or hydroxyl groups and / or halogen atoms are preferably as such functional groups. the amines (a2-s) are preferably selected from the group consisting of 3,3 ', 5,5'-tetraalkyl-4,4'-diaminodiphenylmethane, 3,3', 5,5'-tetraalkyl-2,2 ' - diaminodiphenyl methane and 3,3 ', 5,5'-tetraalkyl-2,4'-diaminodiphenylmethane, where the alkyl groups in 3, 3', 5 and 5 'position can be the same or different and are independently selected from linear or branched alkyl groups having from 1 to 12 carbon atoms, which can carry further functional groups. Preferably, the aforesaid alkyl groups include methyl, ethyl, n-propyl, i-propyl, n-butyl, sec-butyl or t-butyl are unsubstituted Ceweils). In one embodiment of be several or all of the hydrogen atoms of one or more alkyl groups of the substituents Q by halogen atoms, especially chlorine, can be replaced. Alternatively, one may be replaced several or all of the hydrogen atoms of one or more alkyl groups of the substituents Q by NH2 or OH can. It is preferred, however, when the alkyl groups are composed of carbon and hydrogen in the general formula I. In a particularly preferred embodiment component comprises (a2-s) 3,3 ', 5,5'-tetraalkyl-4,4'-diaminodiphenylmethane, wherein the alkyl groups may be the same or different and are independently selected from linear or branched alkyl groups having from 1 to 12 carbon atoms, which may optionally carry functional groups. Preferably, the aforesaid alkyl groups are selected from unsubstituted alkyl groups, especially methyl, ethyl, n-propyl, iso-propyl, n-butyl, sec-butyl and tert-butyl, particularly preferably methyl and ethyl. Very particularly preferably 3,3 ', 5,5'-tetraethyl-4,4'-diaminodiphenylmethane and / or 3,3'-5,5'-tetramethyl-4,4'-diaminodiphenylmethane are. The aforementioned polyfunctional amines of the component (a2) are known in the art per se or can be prepared by known methods. One of the known methods is the reaction of aniline or of derivatives of aniline with formaldehyde under acidic catalysis. As explained above, water can be substituted as the component (a3) ​​all or part of the multi-functional aromatic amine by reacting with a then pre-calculated amount of additional polyfunctional aromatic isocyanate of the component (a1) in situ to a corresponding polyfunctional aromatic amine. When, as component (a3) ​​water is used, as is subsequently carried out preferably comply with certain constraints. As already stated above, the water reacts with the isocyanate groups to amino nogruppen releasing CO2. Thus, partially as an intermediate product to be produced (in situ) polyfunctional amines. They are converted to reaction with isocyanate groups in the further course to urea linkages. However, the CO2 formed must not disturb so much the gelation that the structure of the resulting porous material is affected in an undesirable manner. From this, the outlined above preferred upper limit for the water content based on the resulting total weight of components (a1) to (a4), which preferably at most 30 wt .-%, particularly preferably at most 25 wt .-%, particularly at most 20 wt .-% is. A water content in this range also leads to the advantage that any residual water need not be laboriously removed by drying after gelation. When, as component (a3) ​​water is used, the amount of water used preferably from 0.1 to 30 wt .-%, in particular 0.2 to 25 wt .-%, particularly preferably from 0.5 to 20 parts by weight %, each based on the total weight of components (a1) to (a4), which is 100 wt .-%. vary over a wide range and in particular be 0.6 to 5.
is preferably from 1 to 1, 6, in particular 1, 1 to 1; 4. In a second preferred variant, comprising the use of water, the reaction of components (a1) to (a3) ​​is carried out in the presence of a catalyst (a5). In this second embodiment, it has been found advantageous, from 0.1 to 15 wt .-%, particularly from 0.2 to 15 wt .-%, particularly preferably from 0.5 to 12 wt .-% of water (a3) based in each case to use on the total weight of components (a1) to (a3), which is 100 wt .-%. In the abovementioned areas is particularly favorable mechanical properties of the resulting porous materials, which is due to a particularly favorable result in network structure. A higher amount of water has a negative effect on the network structure and is in relation to the final properties of the porous material is a disadvantage. In the context of the preferred second variant, the above-mentioned components (a1) to (a3) ​​are preferably used in the following proportions, based in each case on the total weight of components (a1) (a3), which wt .-% is 100: from 55 to 99 8 wt .-%, in particular 65-99, 3 wt .-%, particularly preferably 76 to 97.5 wt .-% of component (a1) from 0.1 to 30 wt .-%, particularly from 0 , 5 to 20 wt .-%, particularly preferably from 2 to 12 wt .-% polyfunctional aromatic amine ULTRASONIC (a2) and from 0.1 to 15 wt .-%, in particular from 0.2 to 15, more preferably from 0.5 to 12 wt .-% of water (a3). preferably from 1, 01 to 5. More preferably, said equivalence ratio of 1, 1 to 3, in particular of 1, 1 to 2. An excess n NC0 to n ^ ' "results in this embodiment to lower shrinkage of the porous material, in particular xerogel, in the removal of the solvent and by synergistic effect with the catalyst (a5) an improved network structure and improved final properties shafts of the resulting porous material. In another already explained above, the second preferred embodiment, the reaction according to step (a) in the absence of water. In this preferred embodiment, the components outlined above (a1) and (a2) are preferably used in the following proportions, based in each case on the total weight of components (a1) and (a2), which is 100 wt .-%: 20 to 80 wt .-%, particularly from 25 to 75 wt .-%, particularly preferably from 35 to 68 weight .-% of component (a1) from 20 to 80 wt .-%, particularly from 25 to 75 wt .-%, particularly preferably 32-65 .-% component (a2); no (a3). preferably from 1, 01 to 5. More preferably, said equivalence ratio of 1, 1 to 3, in particular of 1, 1 to 2. An excess n NC0 to n ™ ' "also leads in this embodiment to lower shrinkage of the porous material , in particular xerogel, in the removal of the solvent and by synergistic effect with the catalyst (a5) an improved network structure and improved final properties of the resulting porous material. the components (a1) to (a3) ​​are hereinafter referred to together as organic gel precursor (a) designated. Component (a4) According to the invention (a) the reaction of components (a1) and (a2) in the presence of at least one organic flame retardant as the component (a4). Flame retardants are used on the basis of boron. Component (a4) is preferably used in amounts of 0.1 to 25 wt .-%, preferably from 1 to 15 wt .-%, each based on the weight of component (a1) to (a4), which comprises 100 wt. - gives%. In this area particularly good flame retardant properties result on the one hand and a favorable pore structure on the other. The preferred ranges are valid for all further outlined above embodiments with respect to the components (a1) to (a3). Preferably, component (a4) at least one flameproofing agent which is selected from polybrominated compounds and organic see from the group consisting of phosphorus compounds. Polybrominated compounds are all compounds which contain at least two bromine atoms per molecule. Preferred polybrominated compounds are in particular: pentabromotoluene, pentabromophenyl allyl ether, pentabromoethylbenzene, Decabromdiphe- nyl, pentabromodiphenyl oxide, octabromodiphenyl oxide, decabromodiphenyl oxide, ethylene bis (tetrabromophthalimide), tetradecabromodiphenoxybenzene, ester ether of tetra- bromophthalic anhydride, Tetrabromneopentylglykol and its derivatives. Organic phosphorus compounds are compounds containing at least one phosphorus atom and at least one carbon atom, in particular organic phosphates, phosphonates, phosphinates, phosphites, phosphonites, phosphinites and phosphines noxide. In the present invention, organic phosphorus compounds, preferred are in particular those having a P = 0 double bond, particularly organophosphates, organophosphonates and organophosphine oxides. The prefix Organo characterizes the presence of an organic compound at the abovementioned meaning, and is not limited to the presence of a C-P bond. 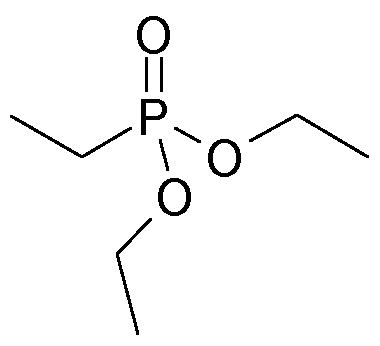 Among organophosphate organic compounds are meant, in which the P-OH groups of phosphoric acid are replaced by P-OR, wherein each R may be the same or different and independently represents an organic radical, particularly a hydrocarbon group which may be aliphatic, araliphatic or may be aromatic and may contain further functional groups. In a first preferred embodiment, component includes (a4) at least one organophosphate. Preferred Organophosphorsäurederivate are those of the structure OP (OR) 3 wherein each R is independently an aliphatic, araliphatic or aromatic Kolhlenwasserstoffgruppe having from 1 to 20 carbon atoms which may carry further functional groups such as ether linkages, halogen atoms and towards isocyanates reactive groups , in particular OH groups and / or NH 2 groups. Preferred organophosphates are especially triaryl and trialkyl phosphates such as diphenyl cresyl phosphate, tricresyl phosphate, triethyl phosphate, 2- ethylhexyl diphenyl phosphate and phosphoric acid-1, 3-phenylene-tetraphenylester and tris (2-chloropropyl) phosphate. In a further preferred embodiment component includes (a4) at least one organophosphonate. Preferred organophosphonates are those of the structure of RPO (OR) 2, wherein each R is independently an aliphatic, araliphatic or aromatic carbon hydrogen group having from 1 to 20 carbon atoms, may carry further functional groups such as ether linkages, halogen atoms and towards isocyanates reactive groups, particularly OH-groups and / or NH 2 - groups. Preferred organophosphonates are especially triaryl and Trialkylphosphonate, diethyl-N, N-bis aminomethyl phosphonate (2-hydroxyethyl) Tetraalkyldiphosphonatver- bonds, dimethyl methanephosphonate, diethyl, and the like, as well as Phosphorpolyole and oxyalkylated Alkylphosphonsäurederivate. In a further preferred embodiment component includes (a4) at least one Organophosphinsäurederivat. phosphine oxide, triphenyl phosphine oxide and tris (2-methylphenyl). The aforementioned flame retardants may be more of the aforementioned compounds can be used singly or in combination of two or more. The flame retardants may be carried out as above contain one or more functional groups. Tri (isopropylphenyl) phosphate (Reofos 95), oligomers Chloroalkylphosphatester (Fyrol 99) ethyl-2-hydroxypropyl 3,4,5,6-tetrabromophthalate, resorcinol-bis (diphenyl phosphates), 2- (2-hydroxyethoxy), bis (hydroxymethyl ) isobutylphosphinoxid, bis (3-hydroxypropyl) isobutylphosphinoxid and trioctylphosphine oxide. In a first preferred embodiment of the inventive method is preferably carried out as component (a5) in the presence of at least one catalyst. As catalysts, in principle, all known to the person skilled catalysts come into consideration that (so-called catalysts Trimerisierungskata-) the trimerization of isocyanates and / or the reaction of isocyanates with amino groups or OH groups (so-called gel catalysts) and / or - if a component (a3 the reaction of isocyanates with water (so-called blowing catalysts) speed - that is, water is used). If no component (a3), that is, no water is used, preferred catalysts have a significant activity for the trimerization. In this way, the homogeneity of the network structure is favorably influenced, resulting in particularly favorable mechanical properties result. Unless reactive (incorporable) catalysts, preferred catalysts also have significant activity with respect to catalyzing the urethane-forming reaction to (gelling reaction). Unless water (a3) ​​is used, preferred catalysts (a5) have a balanced gel to propellant ratio, so that the reaction of the component (a1) with water is not accelerated too much, resulting in a negative influence on the network structure and at the same time a short gelation results, so that the mold release time is advantageously small. Preferred catalysts simultaneously have a significant activity in terms of trimerization. In this way, the homogeneity of the network structure is favorably influenced, resulting in particularly favorable mechanical properties result. The catalysts may be a monomer (installable catalyst) or non-mountable. The component (a5) is used conveniently in the smallest effective amount. Preferably used are amounts from 0.01 to 5 parts by weight, in particular from 0.1 to 3 parts by weight, particularly preferably from 0.2 to 2.5 weight parts of component (a5) based on a total of 100 parts by weight of components (a1) to (a4). In the context of component (a5) preferred catalysts are selected from the group consisting of primary, secondary and tertiary amines, Triazinderiva- th, organometallic compounds, metal chelates, quaternary ammonium salts, ammonium hydroxides and alkali metal and alkaline earth metal hydroxides, alkoxides and carboxylates. Suitable catalysts are in particular strong bases, such as quaternary ammonium hydroxides, such. B. tetraalkylammonium having from 1 to 4 carbon atoms in the alkyl radical and benzyltrimethylammonium hydroxide, alkali metal hydroxides such. B. Potash converted or sodium hydroxide and alkali metal alkoxides such. As sodium, potassium, and sodium and potassium. Further suitable catalysts are in particular alkali metal salts of carboxylic acids such. B. potassium formate, sodium acetate, potassium acetate, potassium 2-ethylhexanoate, potassium umadipat and sodium benzoate, alkali metal salts of long chain fatty acids having 8 to 20, especially 10 to 20 carbon atoms and possibly lateral OH groups. Further suitable catalysts are in particular N-hydroxyalkyl quarternär- ammonium carboxylates, such as Trimethylhydroxypropylammoniumformiat. Organometallic compounds are known to those skilled in particular as gel catalysts per se and are useful as catalysts (a5) also suitable. Organotin compounds such as tin 2-ethylhexanoate and dibutyltin dilaurate are preferred in the context of component (a5). Tertiary amines are the expert as gel catalysts and as catalysts Trimerisierungskata- known. Tertiary amines are used as catalysts (a5) is particularly preferred. Preferred tertiary amines are particularly Ν, Ν-dimethylbenzylamine, Ν, Ν'- dimethylpiperazine, Ν, Ν-dimethylcyclohexylamine, N, N ', N "-tris (dialkylaminoalkyl) -s-hexahydrotriazines, such as. For example, N, N ', N "-tris (dimethylaminopropyl) -s-hexahydrotriazine, tris (dimethylaminomethyl) phenol, bis (2-dimethylaminoethyl) ether, Ν, Ν, Ν, Ν, Ν- pentamethyldiethylenetriamine, methylimidazole, 1, 2-dimethylimidazole, Dimethylbenzyla - min, 1, 6-diazabicyclo [5.4.0] undecene-7, triethylamine, triethylenediamine (IUPAC: 1, 4- diazabicyclo [2,2,2] octane), dimethylaminoethanolamine, dimethylaminopropylamine, N, N-dimethylaminoethoxyethanol, Ν, Ν, Ν-trimethylaminoethylethanolamine, triethanolamine, diethanolamine, triisopropanolamine and diisopropanolamine. In the context of component (a5) are particularly preferred catalysts are selected from the group consisting of Ν, Ν-dimethylcyclohexylamine, bis (2-dimethylaminoethyl) ether, Ν, Ν, Ν, Ν, Ν-pentamethyldiethylenetriamine, methylimidazole, 1, 2-dimethylimidazole , dimethylbenzylamine, 1, 6-diazabicyclo-5,4,0-undecene-7, tris- -dimethylamino, triethylamine, tris (dimethylaminomethyl) phenol, triethylenediamine (diazabicyclo [2,2,2] octane), dimethylaminoethanolamine, dimethylaminopropylamine, Ν , Ν-dimethylaminoethoxyethanol, Ν, Ν, Ν- trimethylaminoethylethanolamine, triethanolamine, diethanolamine, triisopropanolamine, diisopropanolamine, metal acetylacetonates, ethylhexanoates and ammonium Metallio- NEN-Ethylhexanoate. The use of the preferred within the context of the present invention catalysts (a5) results in porous materials with improved mechanical properties, in particular improved compression strength. Moreover, it is reduced by use of the catalysts (a5), the gelation time, that is, the gelling reaction accelerated, without adversely affecting other properties. Solvent according to the present invention takes place the reaction in the presence of a solvent. in the context of the present invention, the term solvent includes liquid diluents, that is, both solvents in the narrower sense, as well as dispersion-medium. The mixture can, in particular a true solution, a colloidal solution or a dispersion, eg an emulsion or suspension be. Preferably, the mixture is a true solution. The solvent is a under the conditions of step (a) liquid compound, preferably an organic solvent. As a solvent in principle an organic compound or a mixture of several compounds into consideration, wherein the solvent at the temperature and pressure conditions, is provided under which the mixture in step (a) (dissolution conditions for short), is liquid. The composition of the solvent is chosen so that it is able to solve the organic gel precursor or disperse, preferably to solve. Preferred solvents are those which are a solvent for the organic gel precursor (A), ie those which completely dissolve the organic gel precursor (A) under the reaction conditions. The reaction product of the reaction in the presence of the solvent is initially a gel, ie a viscoelastic chemical network which is swollen by the solvent. A solvent which is a good swelling agent for the in step (a) network formed, generally leads to a network of fine pores and small average pore diameter, while a solvent which resulting a poor swelling agent for the of step (a) Gel represents, usually resulting in a large-pore network with large mean pore diameter. The choice of solvent thus influences the desired pore size distribution and the desired porosity. The choice of solvent is generally carried out also such that a precipitating or flocculating by forming a precipitated reaction largely does not occur tion product during or after step (a) of the process according to the invention. In choosing a suitable solvent, the proportion of precipitated reaction product is usually less than 1 wt .-%, based on the total weight of the mixture. The amount of precipitated product formed in a particular solvent may be determined gravimetrically by the reaction mixture is filtered prior to the gel point via a suitable filter. Suitable solvents known from the prior art for isocyanate-based polymers are suitable. Preferred solvents are those which are a solvent for the components (a1) to (a5), ie, those constituents the loading of the components (a1) substantially completely dissolve to (a5) under reaction conditions. The solvent is preferably inert, that is non-reactive with component (a1). Suitable solvents are, for example, ketones, aldehydes, alkyl alkanoates, amides such as formamide and N-methylpyrrolidone, sulfoxides such as dimethyl sulfoxide, aliphatic and cycloaliphatic halogenated hydrocarbons, halogenated aromatic compounds, and fluorine-containing ethers contemplated. Likewise suitable are mixtures of two or more of the aforementioned compounds. Also suitable are acetals, especially diethoxymethane, dimethoxymethane and 1, 3- dioxolane, as solvents. Ethyl ether, ethyl isopropyl ether, dipropyl ether, propyl isopropyl ether, diisopropyl ether, methyl butyl ether, methyl isobutyl ether, methyl t-butyl ether, ethyl-n-butyl ether, ethyl isobutyl ether and ethyl t-butyl ether. Preferred cyclic ethers are particularly tetrahydrofuran, dioxane and tetrahydropyran. Aldehydes and / or ketones are preferred as the solvent. As the solvent suitable aldehydes or ketones are in particular those corresponding to the general formula R 2 - (CO) -R 1, wherein R 1 and R 2 are hydrogen or alkyl groups having 1, 2,3 or 4 carbon atoms. Suitable aldehydes or ketones are particularly dehyd acetal, propionaldehyde, n-butyraldehyde, isobutyraldehyde, 2-ethylbutyraldehyde, raldehyd Vale-, Isopentaldehyd, 2-methylpentaldehyde, 2-Ethylhexaldehyde, acrolein, methyl thacrolein, crotonaldehyde, furfural, Acroleindimer, Methacroleindimer, 1, 2,3,6-tetrahydrobenzaldehyde, 6-methyl-3-cyclohexenaldehyd, cyanoacetaldehyde, Glyoxyn- acid ethyl ester, benzaldehyde, acetone, diethyl ketone, methyl ethyl ketone, methyl isobutyl ketone, methyl n-butyl ketone, ethyl isopropyl ketone, 2-acetyl furan, 2- methoxy-4- methylpentan-2-οη, cyclohexanone and acetophenone. The aforementioned aldehydes and ketones can be used in the form of mixtures. Ketones and aldehydes having alkyl groups with up to 3 carbon atoms per substituent as a solvent is particularly preferred. Very particularly preferred are ketones of the general formula R 1 (CO) R 2, wherein R 1 and R 2 are independently selected from alkyl groups having 1 to 3 carbon atoms. In a first preferred embodiment the ketone is acetone. In a further preferred embodiment, at least one of the two substituents R 1 and / or R 2 includes an alkyl group having at least 2 carbon atoms, in particular methyl ethyl ketone. By using the above-mentioned particularly preferred ketones in combination with the inventive method, porous materials with very small average diameter Porendurch- be obtained. Without intending to limit themselves, there is the notion that the pore structure of the resulting gel is particularly fine pores due to the higher affinity of the aforementioned particularly preferred ketones. In many cases, particularly suitable solvents result by employing two or more completely miscible with each other compounds selected from the aforementioned solvents, in form of a mixture. To in step (a) to obtain a sufficiently stable gel which does not greatly shrinks during the drying in step (b), the proportion of the components (a1) to (a4) may on the overall of the components (a1) samtgewicht to (a4 ) and the solvent, which amounts to 100 wt .-%, generally not less than 5 wt .-%, respectively. Preferably, the proportion of the components (a1) to (a4) of the total weight of components (a1) to (a4) and the solvent which wt .-% is 100, at least 6% by weight, more preferably at least 8 wt %, in particular 10 wt .-% at least. On the other hand, the concentration of the components (a1) to (a4) in the provided mixture must not be too high, since otherwise no porous material is obtained with favorable properties. In general, the proportion of the components (a1) to (a4) of the total weight of components (a1) to (a4) and the solu- solvents which wt .-% is 100, more than 40 wt .-%. Preferably, the proportion of the components (a1) to (a4) of the total weight of components (a1) to (a4) and the solvent which wt .-% is 100, more than 35 wt .-%, particularly preferably at most 25 parts by weight %, particularly at most 20 wt .-%. the proportion by weight of components (a1) to (a4) is preferably on the total weight of components (a1) to (a4) and the solvent which wt .-% is 100, a total of 8 to 25 wt .-%, in particular from 10 to 20 wt .-% Particularly preferably 12 to 18 wt .-%. Compliance with the quantity of the materials used in the said area leads to porous materials with particularly favorable pore structure, low thermal conductivity and low shrinkage during drying. Before the reaction of step (a) of the method according to the invention is carried out preferably upstream providing the components (a1), (a2), optionally (a3), optionally, (a5) and (a3) ​​and of the solvent. Preferably, the components (a1) on the one hand and (a2) and (a4) and optionally (a3) ​​and optionally (a5) on the other hand separated each provided in a suitable portion of the solvent from one another. The separate provision allows before optimal control or control of Gelierungsreak- tion and during mixing. Provided that water is used as component (a3), component (a3) ​​is particularly preferably provided separately from component (a1). This avoids the reaction of water with component (a1) under establishment of networks without the presence of component (a2). Otherwise, the preliminary mixture of water with component (a1) leads to less favorable properties with respect to the homogeneity of the pore structure and the thermal conductivity of the resulting materials. Before carrying out step (a) provided a mixture or mixtures can also contain conventional, well-known to those skilled auxiliaries as further constituents. Examples include surface active agents, nucleating agents, antioxidants, lubricants and mold release agents, dyes and pigments, stabilizers, eg against hydrolysis, light, heat or discoloration, inorganic and / or organic fillers, reinforcing agents and biocides are. Further details concerning the abovementioned auxiliaries and additives in the literature can be found in, for example from Plastics Additive Handbook, 5th edition, H. Zweifel, ed. Hanser Publishers, Munich, 2001, pages 104-127. To carry out the reaction of step (a) of the inventive process, must first be produced before a homogeneous mixture of the reaction according to step (a) components provided. The provision of the in the course of step (a) unreacted components can be done in a conventional manner. to a stirrer or another mixing device is preferably used to achieve good and rapid mixing. The time required to produce the homogeneous mixture should be in proportion to the time period in which the gelling reaction leads to the at least partial formation of a gel in order to avoid mixing errors small. The other mixing conditions are not critical, as a rule, for example, one can mix (absolute), especially for example at room temperature and atmospheric pressure, at 0 to 100 ° C and from 0.1 to 10 bar. After forming a homogeneous mixture, the mixing apparatus is preferably switched off. In the gelation reaction is a polyaddition, insbesonde- re a polyaddition of isocyanate and amino groups. Under a gel is a crosslinked system is to be understood on the basis of a polymer (so-called solvogel or lyogel, or with water as a liquid. : Aquagel or hydrogel) in contact with a liquid. The polymer phase forms a continuous three-dimensional network. In the context of step (a) of the process according to the invention is produced, the gel typically by quiescence, for example by simply allowing the container, reaction vessel or reactor in which the mixture is located (hereinafter referred to overall liervorrichtung). (Gelation) is preferably the mixture is no longer agitated or mixed, as this may impede the formation of the gel during gelling. It has been found advantageous to cover the mixture during gelling or to close the gelation. The gelation is known in the art per se and line 13 is, for example, in WO 2009/027310 on page 21, line 19 to page 23, described below. Step (b) According to the invention, in step (b) the gel obtained in the previous step dried by the organic solvent is removed to obtain the organic porous material. In principle, a drying comes under supercritical conditions into account, preferably by replacement of the solvent by CO2 or other suitable for the purposes of supercritical drying solvent. Such drying is known in the art per se. Supercritical conditions are indicative of a temperature and a pressure at which the fluid phase to be removed is present in the supercritical state. This reduces the shrinkage of the gel body of the solvent during the removal can be reduced. The material obtained from the supercritical drying is referred to as an airgel. It is preferred, however, in view of easy process control, the gels obtained by converting the liquid present in the gel in the gaseous feed was to dry at a temperature and a pressure below the critical temperature and the critical pressure of the liquid contained in the gel. The material obtained from the sub-critical drying is referred to as a xerogel. Preferably, drying of the resulting gel by converting the solvent in the gaseous state at a temperature and a pressure below the critical temperature and the critical pressure of the solvent takes place. According DEM is preferably carried out by the drying removal of the solvent that was present during the reaction, without prior exchange for a further solvent. In the subcritical drying, the shrinkage of the gel body is particularly pronounced. It is an advantage of the present invention to minimize shrinkage during drying. Another object of the present invention are obtainable according to the process of this invention porous materials. Xerogels are as porous materials in the present invention, preferably, ie preferably in the present invention obtainable porous material is a xerogel. Under a xerogel is within the scope of the present invention, in particular a porous material having a porosity of at least 70 vol .-% and volume-average mean pore diameter understood by more than 50 microns, which has been prepared by a sol-gel process, wherein the liquid phase by drying below the critical temperature and below the critical pressure of the liquid phase is removed ( "subcritical conditions") from the gel has been. The determination of the average pore size occurs in the context of the present invention preferably by means of mercury porosimetry in accordance with DIN 66133 (1993) at room temperature. The average pore size can be equated in this invention with the mean pore diameter. The determination of the volume-weighted mean pore diameter is determined arithmetically from the determined according to the above-mentioned standard pore size distribution. the volume-weighted mean pore diameter of the porous material is preferably at most 8 microns. More preferably, the volume-weighted mean pore diameter of the porous material is at most 5 microns, very particularly preferably at most 3 microns and especially at most 1 micron. While the smallest possible pore size is desirable for high porosity from the viewpoint of thermal conductivity gerin- gen. For production reasons, and in order to obtain a sufficiently mechanically stable porous material, however, a practical lower limit of the volume-weighted mean pore diameter is obtained. In general, the volume average pore diameter is at least 50 nm, preferably at least 100 nm. In many cases, the volume average pore diameter is at least 200 nm, especially at least 300 nm. Preferably, the present invention available porous material has a porosity of at least 70 vol .-%, in particular from 70 to 99 vol .-%, more preferably at least 80 vol .-% of, most preferably at least 85 vol .-%, in particular from 85 to 95 vol .-%. The porosity in Vol .-% means that said proportion of the total volume of the porous material consists of pores. Although a very high porosity, from the viewpoint of a minimum thermal conductivity usually desirable, but the porosity is limited by the mechanical properties and the processability of the porous material to the top. The components (a1), optionally first partially reacted with water, and (a2) are porous in accordance with the invention available in unreacted material (polymer) form. Due to the inventive composition, the monomer (a1) and (a2) are still predominantly in the porous material levies Harnstoffverknüp- on and / or bonded via isocyanurate, the isocyanurate ratgruppen formed by trimerization of the isocyanate groups of the monomer (a1). If the porous material contains further components other possible linkages are for example urethane groups, which are formed by reaction of isocyanate groups with alcohols or phenols. Preferably, the components (a1) are, optionally partially reacted first with water, and (a2) in the porous material at least 50 mol% before linked by urea groups -NH-CO-NH- and / or via isocyanurate. Preferably, the components (a1) and (a2) are within the porous material of 50 to 100 mol% of urea groups and / or linked via isocyanurate before, in particular from 60 to 100 mol%, very particularly preferably from 70 to 100 mol% , especially 80 to 100 mol%, for example from 90 to 100 mol%. Allophanate, carbodiimide, uretdione and / or urethane. The determination of the mole% of the linkages of the monomer units in the porous material by means of NMR spectroscopy (nuclear magnetic resonance) in the solid state or in the swollen state. Suitable methods of determination are sawn known in the art. The density of the inventive available porous material is usually 20 to 600 g / l, preferably 50 to 500 g / l and particularly preferably 70 to 200 g / l. The inventive method results in an interconnected porous material and not only a polymer powder or particles. The spatial shape of the resulting porous material is determined by the shape of the gel, which in turn is determined by the shape of the gelation device. For example, a cylindrical gelation usually results in an approximately cylindrical gel which can then be dried to a porous material in a cylindrical shape. The available porous materials of the invention have a low thermal conductivity, a high porosity and a low density with high mechanical stability as well as good flame retardancy. The porous materials also have a low average pore size. The combination of the aforementioned properties allows the use as an insulating material in the field of thermal insulation, in particular for applications in the vacuum field where a low thickness of vacuum panels is preferred, for example in cooling Advised or in buildings. Thus, the use in vacuum insulation panels, especially as nuclear material rial for vacuum insulation panels are preferred. Also preferred is the use of porous materials according to the invention for thermal insulation, in particular in construction applications. The materials obtainable by the present invention are characterized by favorable thermal conductivities other hand, on the one hand and by favorable flame retardancy. The favorable thermal insulation properties at normal pressure and at the same time good flame retardant properties, the inventive materials especially for building applications are suitable. EXAMPLES The determination of the pore volume in ml per g of sample, and the average pore size of the materials was performed by mercury porosimetry in accordance with DIN 66133 (1993) at room temperature. The average pore size can be equated in this invention with the mean pore diameter. The determination of the volumengewichte- th average pore diameter is carried out by calculation of the upward-called ter standard specific pore size distribution. The porosity in the unit vol .-% was () V / (V + V s) * 100 volume calculated according to the formula P = .-%, where P is the porosity, the mercury intrusion volume according to DIN 66133 in ml / g and V s is the volume in ml / g of the sample body. The density p of the porous gel in a unit of g / ml = m / (7i * r 2) is calculated according to the formula p * h, where m is the mass of the porous gel, r is the radius (half the diameter) of the porous gel and h the height of the porous gel is. The shrinkage during step (b) of the process according to the invention was true loading by adjusting the height of a cylindrical gel and the diameter cm and were compared after removal of the solvent. The values ​​given refer to the relative volume of the shrunken cylinder in comparison with the gel body prior to removal of the solvent, that is, the shrinkage is reported as volume loss in%. The cylinder had a height of 4.9 cm and a diameter of 2.7 cm before shrinkage. The determination of the flame retardant properties were carried out as described above for the BCT test. Unless specified under the combustibility 5 maximum flame height was 15 cm is not reached, the observed under the BKZ-test flame height was specified instead. Oligomeric diaminodiphenylmethane having a viscosity of 2710 mPa.s at 50 ° C to DIN 53018, a functionality in the range of 2.4 and a content of amino nogruppen of 9.93 mmol / g (referred to as "PMDA"). 2.0 g of the compound M50 was dissolved with stirring at 20 ° C in 10.5 g of acetone in a beaker. 1, 3 g of PMDA and 0.5 g of Exolit OP560 were dissolved in 1 1 of acetone in a second beaker. The two solutions of step (a) were mixed. a clear, low-viscosity mixture was obtained. The mixture was allowed to stand for 24 hours at room temperature to cure. Subsequently, the gel was removed from the beaker and the liquid (acetone) by for 7 days away allow to dry at 20 ° C.
The material obtained had μιη an average pore diameter of 4.0. The porosity was 86 vol .-% with a corresponding density of 233 g / l. The shrinkage was 42%. In BKZ test a flame height of 5 cm was measured. 2.0 g of the compound M50 was dissolved with stirring at 20 ° C in 10.5 g of acetone in a beaker. 1, 3 g of PMDA and 0.5 g of PHT-4-diol 1 g of acetone were ™ dissolved in a second beaker in the first The two solutions of step (a) were mixed. a clear, low-viscosity mixture was obtained. The mixture was allowed to stand for 24 hours at room temperature to cure. Subsequently, the gel was removed from the beaker and the liquid (acetone) by drying for 7 days at 20 ° C removed. 2.0 g of the compound M50 was dissolved with stirring at 20 ° C in 10.5 g of acetone in a beaker. 1, 3 g of PMDA and 0.5 g of Antiblaze® V490 from Albemarle were dissolved in 1 1 of acetone in a second beaker. The two solutions of step (a) were mixed. a clear, low-viscosity mixture was obtained. The mixture was allowed to stand for 24 hours at room temperature to cure. Subsequently, the gel was removed from the beaker and the liquid (acetone) by drying for 7 days at 20 ° C removed. 2.4 g of the compound M50 was dissolved with stirring at 20 ° C in 10.5 g of acetone in a beaker. 1, 3 g of the compound PMDA was dissolved in 1 1 of acetone in a second beaker. The two solutions of step (a) were mixed. a clear, low-viscosity mixture was obtained. The mixture was allowed to stand for 24 hours at room temperature to cure. Subsequently, the gel was removed from the beaker and the liquid (acetone) by drying for 7 days at 20 ° C removed. The material obtained had in comparison to Example 1 to a significantly shrunken form. The shrinkage was 70%. The porosity was 71 vol .-% with a corresponding density of 390 g / l. In BKZ test, a flame height of 7 cm was measured, it being noted that the high density of the material reduces the combustibility. The method of claim 1, wherein the flame retardant of the component (a3) ​​compounds and / or halogen, especially bromine containing phosphorus. The method of claim 1 or 2, wherein component employed (a4) in quantities of 0, 1 to 25 wt .-%, preferably from 1 to 15 wt .-%, each based on the weight of components (a1) to (a4) is, which is 100% by weight. Method according to one or more of claims 1 to 3, wherein component (a4) at least one flame retardant selected from the group consisting of polybrominated compounds and organic phosphorus compounds. Method according to one or more of claims 1 to 4, wherein component (a4) comprises at least one Organophosphorsäurederivat. Method according to one or more of claims 1 to 5, wherein component (a4) comprises at least one Organophosphonsäurederivat. Method according to one or more of claims 1 to 7, wherein component (a4) comprises at least one compound containing one isocyanate-reactive functional group, especially at least 2 such reactive functional groups. Method according to one or more of claims 1 to 8, wherein the at least one polyfunctional isocyanate (a1) of at least one of polyfunctional isocyanate selected from diphenylmethane-4,4'-diisocyanate, diphenylmethane-2,4'-diisocyanate, diphenylmethane-2 , 2'-diiso-cyanate and oligomeric diphenylmethane diisocyanate is constructed. 10. The method according to one or more of claims 1 to 9, wherein component (a1) oligomeric diphenylmethane diisocyanate and has a functionality of at least 2.4. 1 1. A method according to one or more of claims 1 to 10, wherein the component (a2) comprises oligomeric diaminodiphenylmethane and has a functionality of at least 2.4.
wherein R 1 and R 2 may be the same or different and are independently of one another selected from hydrogen and linear or branched Al kylgruppen having from 1 to 6 carbon atoms, and wherein all Substituents Q 1 to Q 5 and Q 1 'to Q 5 'are the same or different and are independently selected from hydrogen, a primary amino group and a linear or branched alkyl group having 1 bis 12 carbon atoms is from, wherein the alkyl group may have further functional groups, with the proviso that the compound according to the general formula I comprises at least two primary amino groups, wherein at least one of Q 1, Q 3 and Q 5 is a primary amino group and at least one of Q 1 ', Q 3', and Q 5 'is a primary amino group. 13. The method of claim 12, wherein Q 2, Q 4, Q 2 'and Q 4' is selected so that the compound of general formula I at least one linear or branched alkyl group which may bear further functional groups, having from 1 having up to 12 carbon atoms in α-position to at least one bonded to the aromatic nucleus primary amino group. 14. The method according to one or more of claims 1 to 13, wherein component (a2) at least one of the following compounds: 4,4'-diaminodiphenylmethane, 2,4'-diaminodiphenylmethane, 2,2'-diaminodiphenylmethane and oligomeric diaminodiphenylmethane. 15. The method according to one or more of claims 1 to 14, wherein the reaction in the presence of a catalyst (a5) is carried out. is temperature and critical pressure of the solvent. 18. A porous material according to claim 17, wherein the volume-weighted mean pore diameter of the xerogel is at most 5 micrometers. 19. The use of the porous material according to claims 17 or 18 for heat insulation. 20. The use of the porous material according to claims 17 or 18 for thermal insulation in construction applications. MX2013010111A MX2013010111A (en) 2011-03-18 2012-03-08 Method for producing flame-proofed porous polyurea-based materials. "Teil B: Prüfbestimmungen", 1988, article "Wegleitung für Feuerpolizeivorschriften: Baustoffe und Bauteile"